Killer Characters: What a CALAMITY if You Don't Enter to Win! What a CALAMITY if You Don't Enter to Win! As I'm sure you probably already know, the authors over at Killer Characters are all about encouraging people to read over the summer. To promote their cause, they're giving away books every single day during the month of June. How great is that? 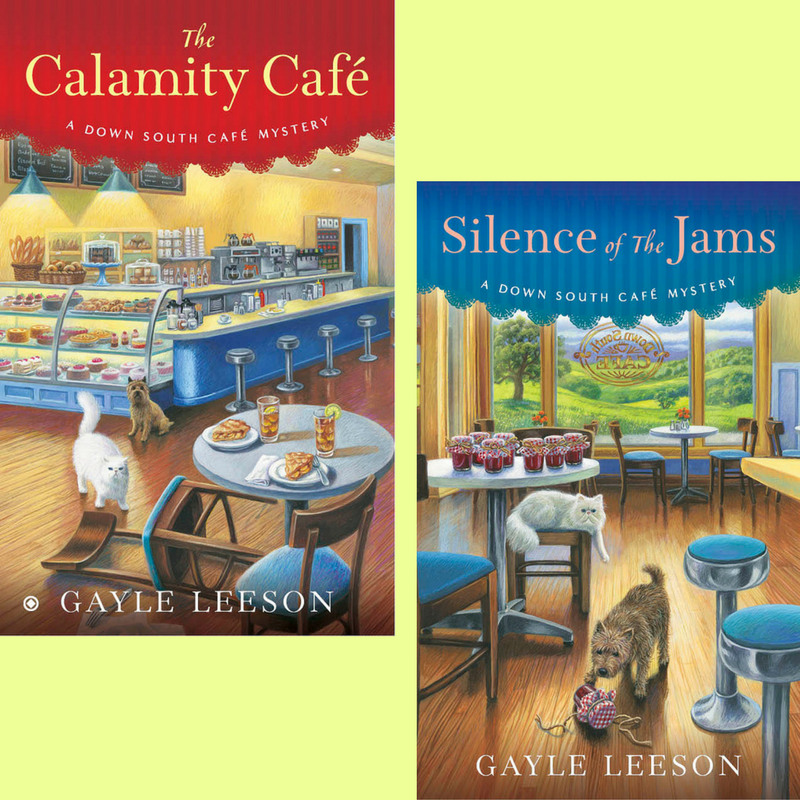 My friend Gayle Leeson--yes, the one Aunt Bess was griping about last month (although Aunt Bess did make up with her when Gayle got her some cookies)--is promoting my adventures here at the Down South Cafe. One lucky winner will win a copy of THE CALAMITY CAFE and a copy of SILENCE OF THE JAMS. If the winner lives in the United States, (s)he will win one signed, paperback copy of each book. If the winner is international, ebooks will be given (Kindle or Nook). All you have to do to be in to win is to comment below with your favorite summer dish to take along to picnics or reunions! Preheat oven to 350 for metal pan or 325 for glass. Beat eggs until frothy. Sift sugar, flour, cinnamon, and salt in a small bowl. The sifting mixes the dry ingredients together for a better blend. Add eggs to the dry mixture. Stir well. Mix corn syrup, butter, and vanilla in a separate bowl. Add to the first mixture. Slowly mix in oatmeal. Stir 2-3 minutes to ensure even distribution of oatmeal. Pour into pie crust and bake for 45 minutes. Don't forget to enter the giveaway! Just comment below with your favorite dish to take to a reunion or picnic (even if it's a bucket of KFC) to win a signed copy of THE CALAMITY CAFE and SILENCE OF THE JAMS. Remember, if the winner is international, he or she will win ebooks. Good luck! <ine is a tuna noodle salad made gluten free. A nice refreshing fruit salad. cream for those who want it. Cool dish for a hot day outside. I like to take mac and cheese to Reunion. BBQ spareribs always taste better when you have mac and cheese as your side item. Macaroni and Tuna salad. It always disappears. My boyfriend's vegan apple cake. It doesn't need to be refrigerated and always disappears. I love making different pasta salads. They are easy but I can get creative too. I usually take potato salad and keep it cold. Is there a substitute, like honey, for the corn syrup? My favorite thing to make is a simple strawberry pie made with strawberries and strawberry jello in a graham cracker crust. It can even me made as no-sugar added for diabetics. Yummy! Cabbage and tomato slaw...goes everytime fast at events. Thank you.. I like to take a simple cucumber salad. Just mix cukes, sour cream, and an onion with vinegar and just a teaspoon of sugar. Add a dash of salt and pepper and you've got a tasty dish. We usually bring pasta salad or a dessert. Asian marinated cucumbers - rice vinegar, oil, soy sauce, garlic, sugar and red pepper flakes. My favorite dish to take in the summer is my Mom's Corn Salad. It's one of my favorites. This is a new series to me, would enjoy reading. I like to take my homemade potato salad. Macaroni salad is my favorite thing to take to a picnic. Thanks for the chance to win! aut1063(at)gmail(dot)com. A home-made fresh fruit salad is always a hit. For children: Jello jigglers. For adults: Fresh fruit salad. Stuffed potatoes or spaghetti and meatballs. I like to make orange or strawberry salad or a red velvet cake with vanilla, sour cream, cream cheese icing. Tropical cheesecake with fresh blueberries and raspberries. This disappears FAST! It depends on the weather whether I take something hot or cold, but my signature potluck item is a pasta salad loaded with fresh vegetables mixed in a vinegar dressing rather than mayo. I like to bring homemade fudge. I bring my favorite (and everyone else's) potato salad. Thanks for a chance to win. I would bring either a pasta salad or a dessert, probably brownies. I'm going to say potato salad. Thank you so much for the chance to win both books. They look great!! Pasta salad with chopped ham, cherry tomatoes, cucumbers, black olives and Italian dressing. You can add whatever veggie is in season. Frozen Fruit Pizza (sugar cookie base with cream cheese. powdered sugar, and fresh or canned fruit). I like to make a fruit salad, with plenty of peaches and watermelon. Thanks for the chance to win! My favorite dish to take is ranch styled beans. I was going to say an empty dish since there are so many good things usually to choose from. lol! But seriously I usually take brownies or cookies for a dessert and as a main course I like to make pasta salad. With the pasta salad I don't need to worry about food poisoning since I use an Italian dressing on it. Thanks for the opportunity to enter this giveaway and to learn more about Gayle Leeson's books. Fingers are crossed that I'm chosen. It's not a picnic for me if I am cooking! I will gladly being the hot dogs, buns and condiments with paper plates so I can lounge around and read a good book on the beach or swim! For some reason, the website prevented me from replying to everyone, but I do appreciate all your comments and your dishes sound delicious! :) And now on to our winner... The random number generator has chosen TRAVELER! I'll email you to get your information Congratulations! Thanks to everyone who entered. I make a strawberry and blueberry parfait that is so good. I like to take something gluten free, so that I know there will be something I can eat!! I always take a cold pasta salad and some salsa with chips. These seem to go first. I love potlucks since I get introduced to some good eats!